Hull-bound Halifax centre Nick Rawsthorne has said it was a “dream come true” to play in Sunday’s Championship Shield derby against Bradford. Rawsthorne, who will join the Super League leaders in 2017, made his senior debut alongside his friend and former Brooksbank School teammate Chester Butler - who had made his Championship bow against Sheffield seven days earlier - as Richard Marshall’s side slipped to a 44-22 loss at Odsal. 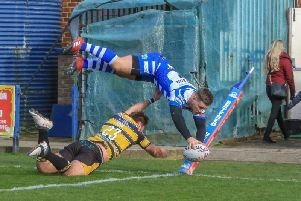 Rawsthorne, a former Leeds junior who only joined Fax’s revamped reserve set up in January, made the most of limited attacking chances, dancing past former top flight threequarter Kris Welham early in the game and setting up a try for James Saltonstall on the stroke of half time. “I loved it, getting out there and getting to play for Halifax; it’s what I’ve wanted to do since I was a little youngster watching them,” said Rawsthorne. “It was a dream come true for Brooksbank School and for me getting to play at that level with one of my best mates. “It was great, going out there and while it’s hard and a step up, I don’t think we looked out of place at all. “We were both a bit nervous before the game, but we take it as it comes and try and enjoy every game that we play. But while Fax will profit from Butler’s continued development into next season, Rawsthorne’s talent will benefit Hull FC, whose full time contract offer trumped a two year part time deal to stay with his hometown club. “It would have been hard to walk away from; they’re top of Super League and they’re a full time team,” said Rawsthorne. “Halifax is my club and will always be my club, but I couldn’t turn down the chance to be full time. “It’s a one year deal with an option for them to make it three years; it’s a development contract, but it’s full time with their first team squad. “If I had waited a bit longer, I might have had that option at Leeds before I came here, but things didn’t work out. “Coming back to Halifax on loan has been mentioned, which would be awesome; if I go out on loan next season I want it to be here. “Dropping down a level has actually helped me a lot and hopefully I’m on the up again now.